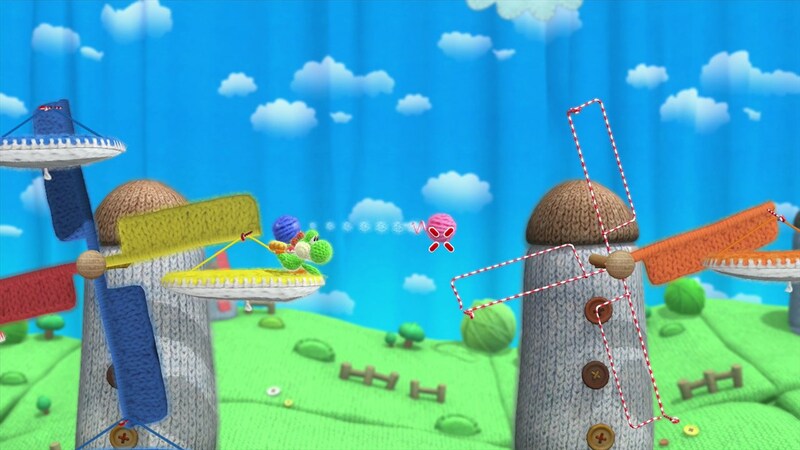 Kirby’s Epic Yarn, Yoshi’s Woolly World and Wario Land: Shake It! are perhaps three of the most off-beat Nintendo games from the past decade, as each features a striking visual style. Be it experimenting with the likes of wool fabric or cel-animation, all three of Good-Feel’s home console efforts for the company have etched a unique niche within Nintendo’s library. 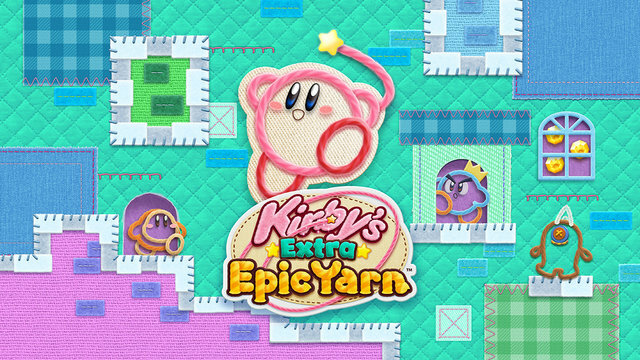 However, I personally find their accompanying music to be just as special; in particular, Kirby’s Epic Yarn is one of my favorite gaming soundtracks of all time, as its soothing, nostalgic sound always instills a Zen-like state in times of stress. 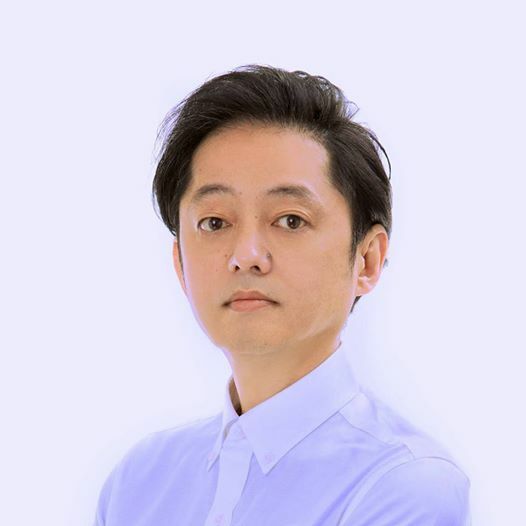 Not too long ago, I had the absolute pleasure of speaking with Tomoya Tomita, the composer for all three of Good-Feel’s home console Nintendo games. While he’s recently gone freelance, Tomita-san was more than happy to discuss his time working for Good-Feel and Nintendo. The majority of the interview focuses on the aforementioned games, but we also take the time to discuss Tomita-san himself and his current plans as a freelancer. The translation for this interview was handled by Masked Man of Source Gaming; without him, this exchange would never have been possible and I’m grateful for his service. And of course, a huge thank you to Tomita-san for accepting my offer!! Without further ado, I present to you our discussion. First off, I’d like to thank you again for agreeing to this interview. Can you please tell us a little about yourself? My name is Tomoya Tomita. I am a game music composer, most recently working on Kirby’s Epic Yarn, Yoshi’s Woolly World, and Poochy & Yoshi’s Woolly World. What made you get into music; to be specific, game music? You initially composed games for Konami, correct? I never received any formal training, but I started playing guitar when I was 13 and played drums in an amateur band at 16. Initially, I helped out with the family business, but I got sick of it (laughs). Then, one day I saw Konami had placed an ad in a music magazine saying they were looking for people to join their sound staff. I applied and got the job. Can you please tell us how you started at Good-Feel? During my last five years at Konami, I actually wasn’t a member of the sound division. 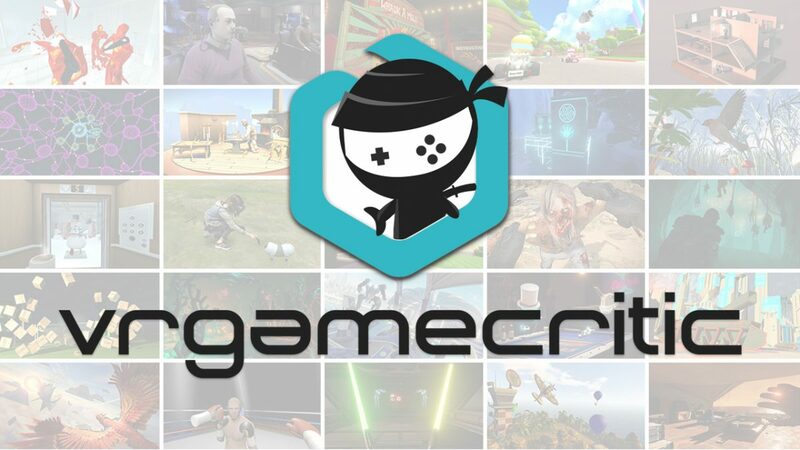 After I decided to leave the company, I found out some of the developers with whom I worked on the Goemon series were starting their own company, and I decided to join them. I’m very grateful for the opportunity to get back to writing music. What is your design process in composing music? Basically, I just take the music I hear in my head and give them proper form. I’m not very good at reading and writing sheet music, though, so I program everything directly into Cubase. First, I play some musical “memos” on the piano to get a feel for the melody, harmonies, and rhythm. I then use that as a base when I create the full arrangement. Do you have any influences or heroes in the game music field? Or outside? My tastes in music are rather eclectic, so I couldn’t possibly list everyone I admire by name. Rather than single out one artist, I’ll just say all my favorite artists inspire me in their own way. This was your first project for Nintendo. Did you feel any pressure? Of course I did! I hadn’t done any sound work for a while, nor had I composed anything for almost a decade, so I wasn’t sure I could do it. 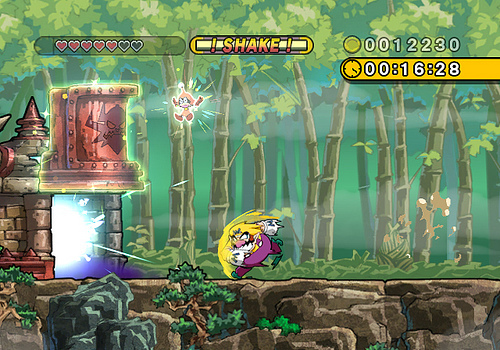 The design director for the game mentioned he wanted to adhere to the “cool” image of Wario as opposed to the grosser image Nintendo adopted for other Wario-related titles. Was this a theme you were conscious of echoing in Shake It? I actually had no idea he said that! Coincidentally, though, I had the exact same idea (laughs). How much influence did you take from past Wario games? I recall that Glittertown had a remix of Greenhorn Ruins from Wario World. It’s not a remix—it’s literally the same track. I just replaced the instruments and overlaid myself playing guitar. 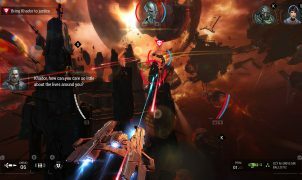 The hand-drawn artstyle was a huge draw for the game, so how did you design the music around that? After looking at the visuals, I tried coming up with I could convey the “cool” side of Wario. The first style that came to mind was funk, and I thought that would be a good fit. You had to essentially design two songs per stage – the main theme, and the “escape” theme. Was this a challenge? You bet it was! I mentioned I already wasn’t very confident when I took on this project, so when I heard I had to write twice as many pieces, I nearly lost all hope (laughs). I also had to design all the sound effects, so it was quite a challenge, indeed. That said, the process became a lot more enjoyable as I went along (laughs). Minako Hamano-san is also listed as a music credit. Did you two collaborate together? We didn’t actually collaborate. Right when I began the project, Nintendo sent me three pieces used in previous Wario titles (one of which was Greenhorn Ruins) and said, “Here—use these.” I imagine Hamano-san composed those. In an interview with Nintendo Dream magazine, you cited Mt. Lavalava as being your favorite song. Is that still the case? Yes, it is. I think I did a good job of capturing the “cool” and “funky” side of Wario in this piece. I’m personally a fan of Soggybogg River and its strange rhythm which, combined with the grimy setting, creates a very unusual atmosphere. How did you go about composing that? I’m pretty sure I took a look at the concept art for the stage and decided to go with an irregular time signature. I don’t really remember, though (laughs). 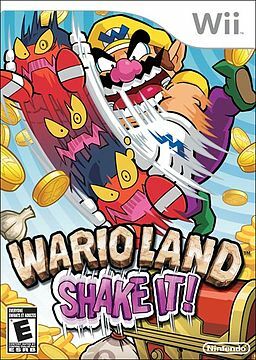 In Super Smash Bros. Brawl, Wario’s victory theme was an arrangement of the Stonecarving City theme from Shake It!, which hadn’t yet come out. Were you involved in this special cameo? No, that was another piece I received from Nintendo. I didn’t do anything for Brawl. When you heard the game was taking on a yarn theme, how did you approach composing the score? Director Madoka Yamauchi explained to me she wanted to create a game that little kids could play with their mothers, so rather than compose for a game, I envisioned writing music for a picture book. The first idea that came to mind was centering my compositions around a single acoustic instrument, like a guitar or a piano. Ultimately, I decided on the piano because of the variety afforded by its impressive range of tones and dynamics. Plus, MIDI samples made editing really simple (laughs). Despite choosing the piano, however, I’m not much of a pianist myself, so I researched many performance styles and did a little practicing. You also had to adhere to the Kirby theme. While most of the past Kirby games were fast-paced, Epic Yarn is deliberately slow. Did you struggle with this balance? Not really. Prince Fluff was the protagonist until the later stages of development, so I didn’t think about Kirby when composing most of the pieces (laughs). 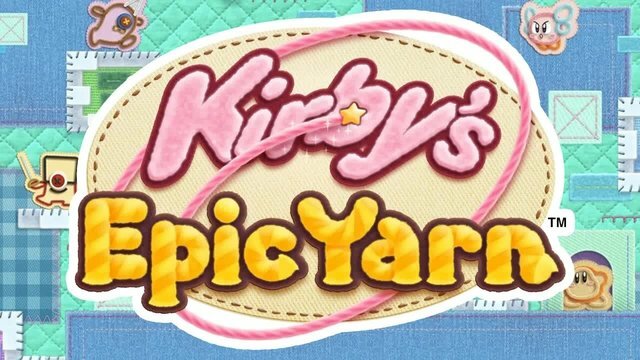 If Epic Yarn had been a Kirby game from the very beginning, I probably wouldn’t have even been involved, so I was very fortunate. 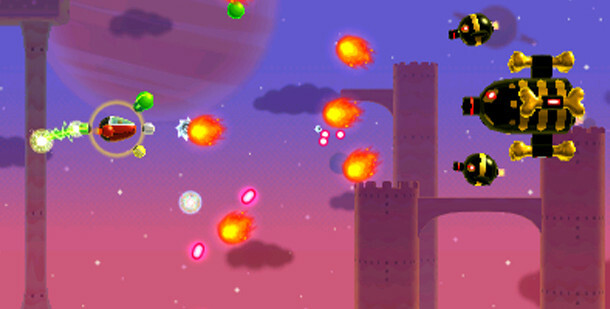 I felt the game succeeded at creating its own niche, but did you look at past Kirby games to channel their feel? As I mentioned, Kirby didn’t even enter into my mind. The music I had composed was very unlike previous titles in the series, so when the game became a Kirby title late in the development cycle, I was worried the folks at HAL would shoot down all of my compositions. Thankfully, however, [Tadashi] Ikegami-san respected the work I had done, so I was able to continue writing music just as I had up until that point all the way to the end of the project. The game has its upbeat tracks, but I’m still amazed at how calming the game’s music can be; I always find myself wanting to curl up and relax. How did you accomplish this? As I mentioned earlier, I originally set out to write music for a picture book—something for a mother to read with her child. In that sense, I suppose many of the tracks are quite soothing. I thought a piano-only soundtrack might grow a bit repetitive, though, so I sprinkled in some symphonic pieces as well. However, as development moved along, Epic Yarn became more of an action game, so I had to adjust my compositional style to match. The shooting and racing sequences certainly took me by surprise. Thanks to their addition, though, the soundtrack became much more varied. Members from HAL’s sound team (Jun Ishikawa, Hirokazu Ando and Tadashi Ikegami) eventually joined the project, but apparently had a difficult time adjusting to the sound template you already set for the game. Did you collaborate with them? No. I met with them once to check which tools and plugins they were using, but they had pretty much the same setup, including Synthogy’s Ivory piano plugin. Now that I think about it, the incredible quality of Synthogy’s Ivory plugin is one of the reasons I decided to focus on the piano in my score for the game. It was implied they worked on the songs that appeared towards the game’s climax, where the BGM features arrangements of previous Kirby songs. Was this the only thing they did? By the time the game changed into a Kirby title, music for six of the seven worlds was already complete. Ikegami-san asked if I wouldn’t mind letting him participate in the soundtrack, and since the final world in the game was going to be Dream Land, the HAL team ended up writing the music for it—which worked out well for me since I had fallen behind creating sound effects (laughs). Fountain Gardens is one of my favorite opening levels in a 2D platformer; everything from the aesthetics to the music to swinging as a bell from a tree creates a child-like sense of wonder. What was the composition process behind that like? I’m happy to hear you like it so much. Actually, I had initially planned to use what became the Staff Credits music on Fountain Gardens. The original storyline was that the timid Prince Fluff would go on a journey to find his lost mother, so I had hoped to create a new kind of feeling with the opening of the game: create a piece of music that is soft and sweet, but also somewhat sad and unsettled. As development went along, I realized the game was more conventional than I had originally anticipated (laughs). I then took the main theme I wrote—heard in Flower Fields—and gave it a slightly richer arrangement. That’s how Fountain Gardens came to be. I initially wanted to use an even richer arrangement for this piece, but I reduced the number of instruments in order to better fit Nintendo’s style and went with a simple, stripped-down ensemble. I’m also a huge fan of the main theme, which premieres on the title screen and is elaborated further on Flower Fields. Both always take me back to my childhood; did you have a specific theme in mind when composing it? That’s great to hear. Since I envisioned a child playing with their mother, I tried to keep my musical motifs as simple as possible, and after playing around with permutations of do, mi, and sol, I ended up with the main theme. The notes and structure aren’t anything original, but I think the simplicity works. Also, this is a bit of an easter egg, but this motif makes an appearance in Yoshi’s Woolly World, too. For Melody Town, did you have to work between the relationship of the music and the on-screen instrument effects? Not at all! The team told me beforehand they were considering adding a stage focused on musical instruments, so I asked them to consult me before they started creating it so we could make sure the music matched. Then, one day, Melody Town was completed without so much as a word from the team (laughs). I imagine I would have done a much better job if they had actually contacted me during the planning stages (laughs). Snowy Fields, which also plays on Evergreen Lift, is a spectacular winter piece. It just screams Christmas to me. What was composing that like? Well, then, you’ll be interested to know I coincidentally wrote this piece on December 25th! Personally, I love snow. Every time the flakes start falling, I get giddy like a little kid. In that sense, it’s hard for me not to think about Christmas whenever I compose music for a snow stage (laughs). Do you have a favorite track of yours from the game? 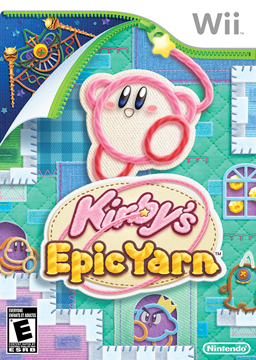 Kirby’s Epic Yarn was a very special project for me, and I like pretty much all the music I wrote. If I had to pick a favorite, though, it would be either Rainbow Falls or Big-Bean Vine. I remember going home after writing those pieces and telling myself, “You really knocked it out of the park today!” (laughs) I also really like the Staff Credits music. 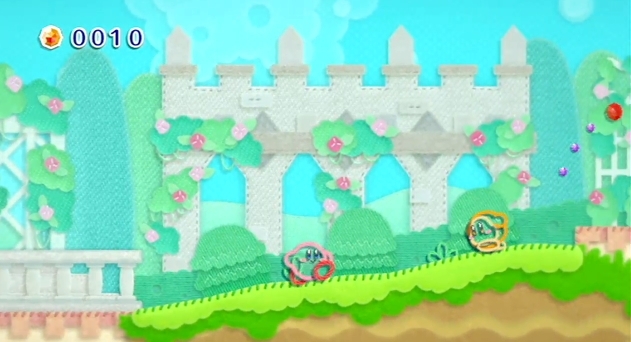 Both this and Epic Yarn feature a very similar aesthetic, but Kirby and Yoshi music can be pretty different. How did you go about composing this title? The process was, of course, different than the one I employed for Kirby’s Epic Yarn. I gave up on using the acoustic guitar in that title, but I made a point of focusing on it in Woolly World—and, as you can hear, it is featured in many pieces on the soundtrack. I had played guitar for quite some time, but recording is an entirely different beast, so I did a lot of practicing before I began writing music. I took lessons to learn proper fingerings. I even studied how to take care of my nails (laughs). While there are calmer tracks present, I think this has a more active feel than Epic Yarn; personally, the game’s music evokes an image of being on a hayride. Did you have any specific theme in mind? I’m so glad to hear it brings that image to mind! I happen to love country music, and that’s exactly what I had in mind while writing the music. Even on tracks that don’t feature a very country sound, I tried to use acoustic or pedal steel guitars as much as possible. There are even some pieces that feature a slide-style guitar or a harmonica. I think I did an especially good job capturing that feeling in the title screen music. I’m quite fond of it. Yoshi games have had a variety of composers, each diving into different styles. While Kazumi Totaka (who did Yoshi’s Story) composed Woolly World’s main theme, did you look to any other past games (such as, say, Koji Kondo’s work on Yoshi’s Island)? Did Totaka-san supervise the game? Yeah, I listened through all the SNES and N64 Yoshi soundtracks. Mr. Totaka didn’t supervise the game, but I’m very grateful to Emi Watanabe from Nintendo for her assistance. Without her, the music would have ended up sounding much different. I think Knitty-Knotty Windmill Hill has that “hayride” quality I mentioned, although it’s very calming as well. What did you have in mind when you composed it? I’m happy to hear you enjoyed it. When I wrote that piece, I was focused less on a style of music and more a style of performance. I made a point of playing this and many other pieces in the Travis picking style—one that might bring back memories for some people since it isn’t heard much nowadays (laughs). It matches perfectly with the sound of the pedal steel guitar to create a very calm, comforting atmosphere. Bounce-About Woods was stuck in my head for days after I first heard it. Did you make it that infectious on purpose? I most certainly did! My goal was to create the catchiest, most upbeat music I could for the E3 presentation. The straightforward rhythm of one-two-three! goes quite well with the simple harmonies, if I do say so myself. It’s a shame they didn’t end up using that piece at E3 (laughs). When I first heard the Special Course theme, I thought to myself, “this is why I play video games.” How did you go about composing that? Sadly, however, I don’t remember much about the composition process (laughs). I think I just wanted to write something uptempo. I do remember that the original was twice as long. After listening to the first version in-game, I rewrote it to be much shorter. I think the winter themes were very well-done here too. What was the process behind them? I’m glad you enjoyed them. Much like I did in Epic Yarn, I set out to write bright, Christmas-y pieces for the snowy stages. Do you have a favorite song from the game? 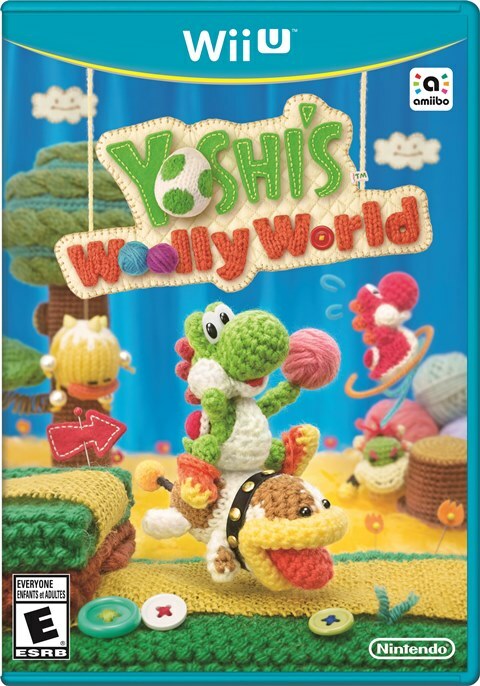 Woolly World is another title with a special place in my heart, and I love just about every piece I wrote. I’m particularly happy with the title music, Clawdaddy Beach, Fluffin’ Puffin Babysitting, Shy But Deadly, Lava Scarves and Red-Hot Blarggs… The list could honestly go on and on—I love the soundtrack that much. 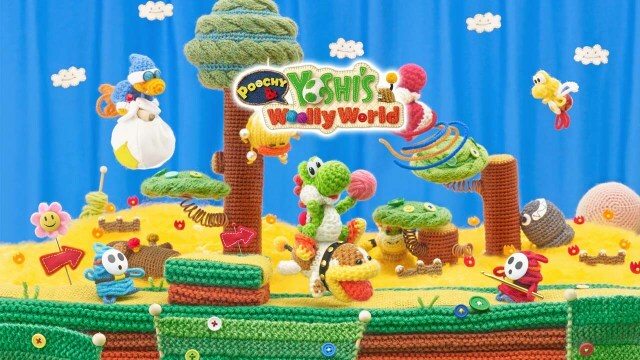 Poochy and Yoshi’s Woolly World, the 3DS port, was released not too long ago. Can you please tell us your involvement in that? I adjusted the mixing on several pieces. They’ve also added some Poochy stages to the game. Those feature new music, although I wasn’t the composer. Honestly, the game is worth playing just for the adorable videos of Poochy and Yoshi. Be sure to check it out! You helped compose four games for 3DS’s StreetPass Mii Plaza: Mii Force, Battleground Z, Slot Car Rivals, and Market Crashers. What were those like? I wasn’t directly involved in the composition process; I just oversaw the music production on those titles. Very recently, you announced a freelance career. What spurred this decision? Do you think you’ll be working with Nintendo/Good-Feel again? Good-Feel closed their Kobe office, so I had to venture out on my own, but I’d love to work with them again in the future. Thanks for reading this interview! I’d like to express my gratitude to all of you who enjoyed the Kirby and Yoshi soundtracks I worked on. I’ll be sharing my music and any upcoming projects via my Twitter, Facebook and YouTube, so be sure to have a look! Tomita-san, I’d like to close out this interview by sharing a personal anecdote I mentioned when I first reached out to you. My older brother sadly passed away two months before Kirby’s Epic Yarn‘s release, and that was a game I was already awaiting with great hesitation. Kirby was a series I loved very deeply growing up, and so for this new title I’d have to juggle my expectations from a new developer alongside my family’s grief. I’m sorry to hear you went through such a tragic experience. You have my condolences. At the same time, knowing that my music was able to help you overcome such a difficult time makes me very glad. I will keep composing, and I hope my work continues to bring joy to you and others like you. 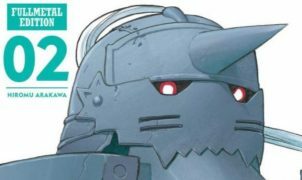 Once again, a huge, huge thank you to Tomita-san for participating in this interview!